Save on your next flight from BCN to SAL when you book through Travelocity. Need a last-minute flight to San Salvador? Travelocity offers discount airfare no matter when you book, even on popular routes such as Barcelona Intl. Airport to El Salvador Intl. Airport. Whether you need a direct or indirect flight, you can trust Travelocity to provide you with the best prices for BCN to SAL flights. Top Flights from Barcelona Intl. Top Flights to Barcelona Intl. Explore San Salvador with Travelocity's Travel Guides to find the best flights, cars, vacation packages and more! Gave us an extremely noisy room with a window showing a group of musicians playing disgusting music, very loud and in very bad taste. Very inconsiderate to put tired travelers, who come after many hours on a plane and need rest, in a room in front of a loud orchestra playing ridiculous music. Situated in San Luis Talpa, this hotel is within 16 mi (25 km) of Walter Thilo Deininger National Park, San Diego Beach, and San Marcelino Beach. Costa Del Sol Tourist Center and Playa Costa del Sol Football Stadium are also within 20 mi (32 km). 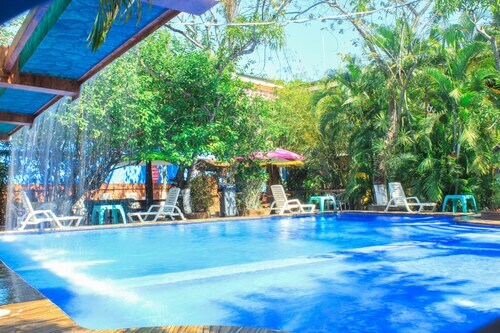 Situated in San Luis Talpa, this bed & breakfast is within 20 mi (32 km) of Walter Thilo Deininger National Park, San Diego Beach, and Lake Ilopango. Playa San Blas and El Majahual Beach are also within 20 mi (32 km). Love the way staff made us feel welcomed and at home. The hotel has excellent service and has a tranquil feeling about it. Each corner invites you to sit and relax! Loved the place and plan to return later this year. 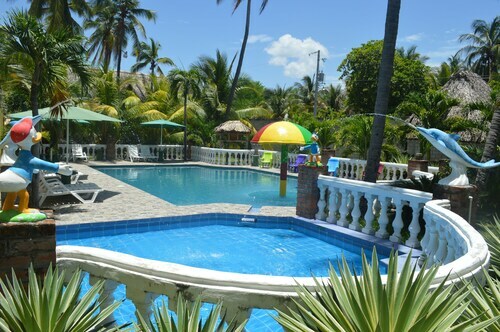 See all 17 Properties in El Salvador Intl.